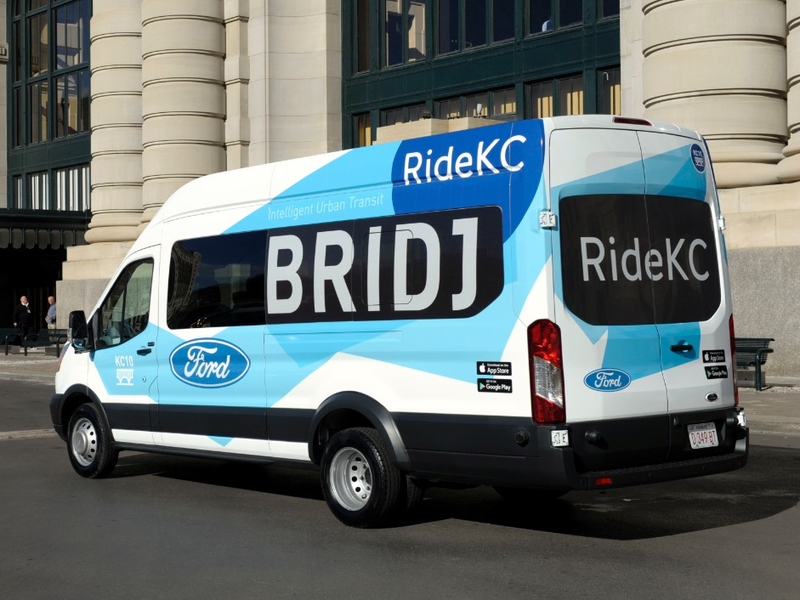 Ford on Thursday announced the new one-year pilot initiative, dubbed Ride KC: Bridj, with the aim to provide greater mobility options to residents of Kansas City by enhancing existing mass transit. Ride KC, which it’s promoting as the first U.S. public-private collaboration in on-demand services, is a collaborative effort between Ford, Bridj, and the Kansas City Area Transportation Authority. Under the program, which is set to launch in early March, a fleet of 10 locally built Ford Transit vans will be available for residents to summon via the Bridj app. To hail a ride, Ride KC users simply open their app, input their location and their destination, and then choose from a list of available prearranged times that one of the shuttles will arrive at a nearby pop-up bus stop. Hailing the bus entitles the person to just one seat in the shuttle, which can hold a total of 14 people. The program is meant to augment and serve as a gateway to other forms of transit as many pick-up locations will be at bus stops and areas served by existing Kansas City transit and bike-share systems, Ford says in a statement. For now the service will include downtown Kansas City, the near east and west sides, Hospital Hill, Crown Center, portions of Midtown, University of Kansas Medical Center and the Historic 18th and Vine Jazz district, with additional routes to be added based on rider demand.